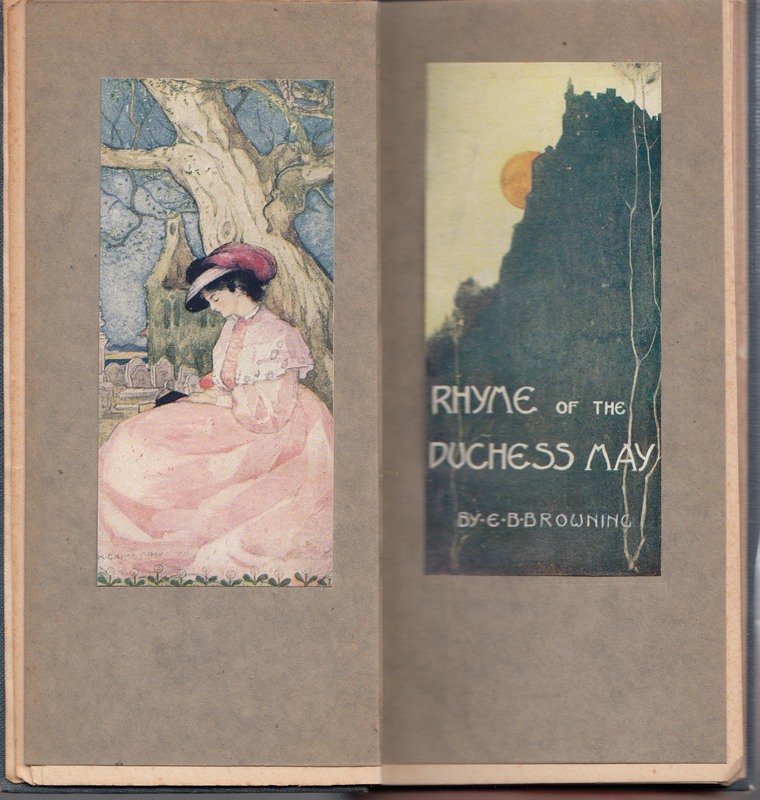 The firm’s books were illustrated by significant, turn of the century artists, including Frank Brangwyn, W. Russell Flint, Robert Gemmell Hutchison, Jessie M. King, and Frederick Cayley Robinson. The Envelope Books were a gift book series. 17 titles were issued. The least expensive (6d.) version of the Envelope Books was intended to substitute for Christmas cards. These were sold in “wrappers” which could be folded into an envelope and used to mail the books. Thus the series name. 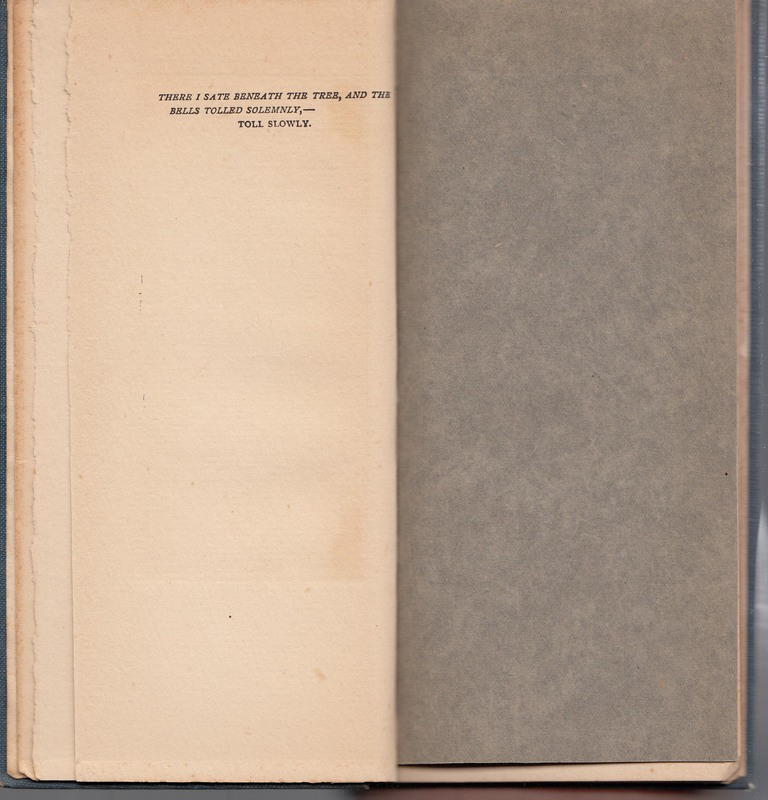 These copies, priced at 6d., included a “Christmas Greeting” page and had flexible card covers. Series titles were also available in cloth, with “mounted illustrations” for 1/- and in velvet calf yapp, with “mounted illustrations” for 2s./6d. The cloth titles were issued in tissue wrappers. I’m not aware if cloth titles were issued with the additional envelope wrappers. I’m also not aware if the velvet calf yap titles were issued with a tissue jacket, envelope wrappers or other covering. The Envelope Books were first issued in 1907. The series was issued in the US by George W. Jacobs of Philadelphia. Titles published by Foulis appear as late as 1915, and by Jacobs as late as 1912. 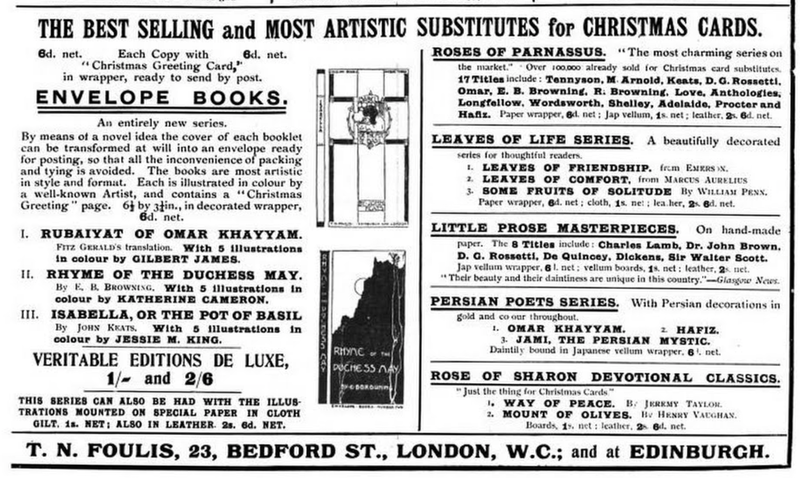 An advertisement for the initial titles in the series is below (British Books, 1907). The advertisement liss other series of the same ilk, the Roses of Parnassus, Leaves of Life Series, Little Prose Masterpieces, Persian Poets Series, and Rose of Sharon Devotional Classics. Many more Foulis series are listed at Books and Writers. 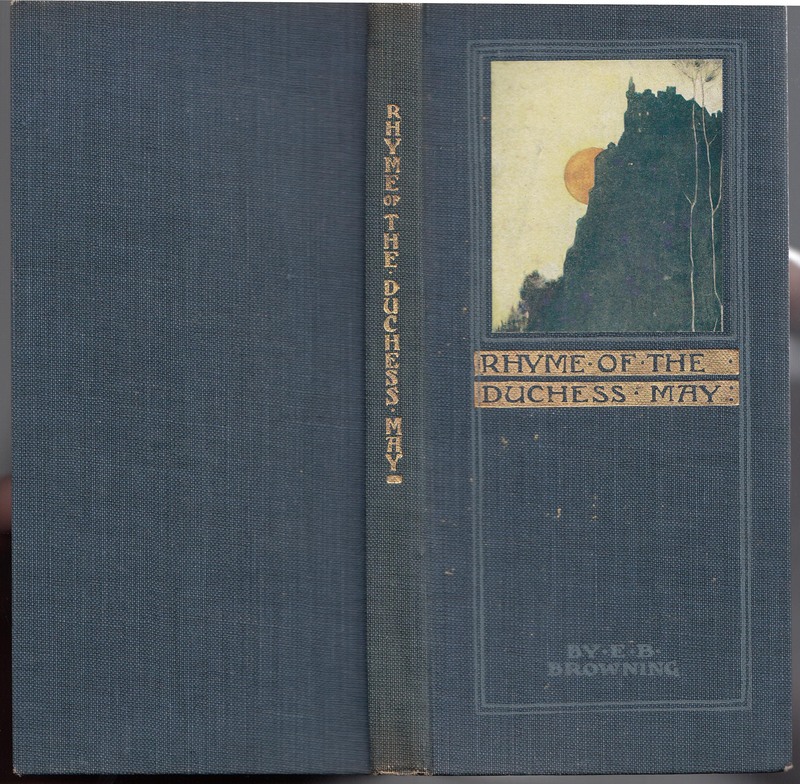 This copy of Elizabeth Barret Browning’s Rhyme of the Duchess May is undated, but probably published in 1907 or soon afterward. It is a clothbound title, priced at 1/-, double the soft-bound Christmas card substitutes, but significantly less than the velvet yapp bound titles. This copy has a tissue jacket. It’s possible the book had a box or envelope, but I’ve seen no mention of either in the advertisements nor found a copy with such attributes. The blue cloth covers contain the title of this small, oddly (envelope) shaped book. The illustrations for this particular title are by Scottish artist Katherine Cameron. One of the illustrations from the book is glued to the front cover. The text is debossed in gold and pale blue ink. 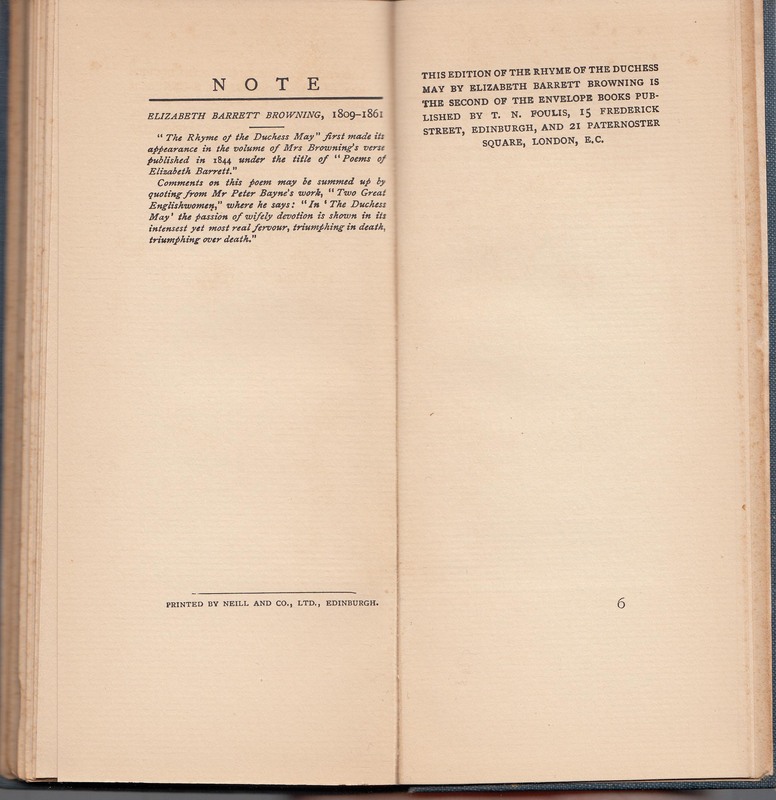 A quote is included on the verso of the half-title page. Illustrations in the book are printed with the text (in monochrome) and, in this edition, mounted on heavy grey paper (in color). 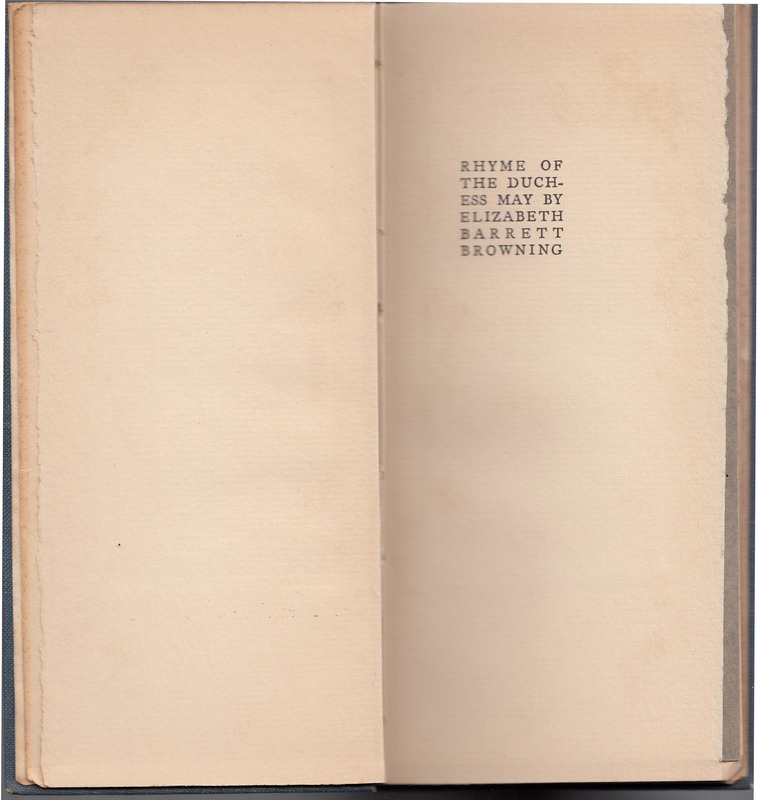 The first set of color illustrations includes, on the right, what seems to be the title page of the book, including the title and author, but not the publisher. A list of illustrations by Cameron follows, each with the quote that inspired the illustration. 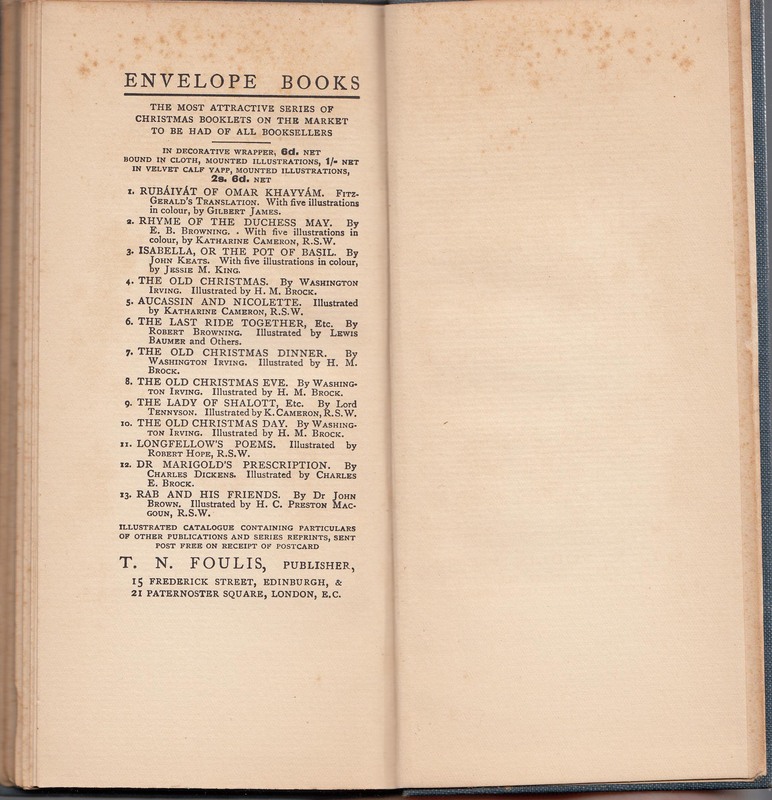 The back matter in the book includes a note about the author, Browning, and, on a facing page, indicates that this book is the second Envelope Book published by Foulis. A catalog of the initial 13 titles in the series describes the three different versions of the Envelope Books. 1. Rubaiyat of Omar Khayyam. Fitzgerald’s Translation. With Five Illustrations in Colour, By Gilbert James. 2. 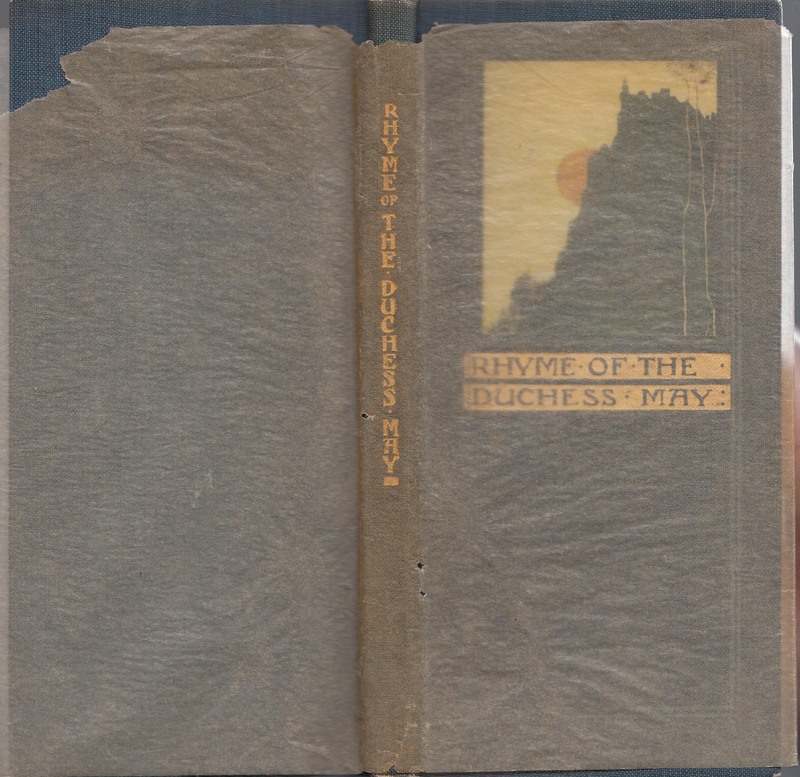 Rhyme of The Duchess May. By E.B. Browning. 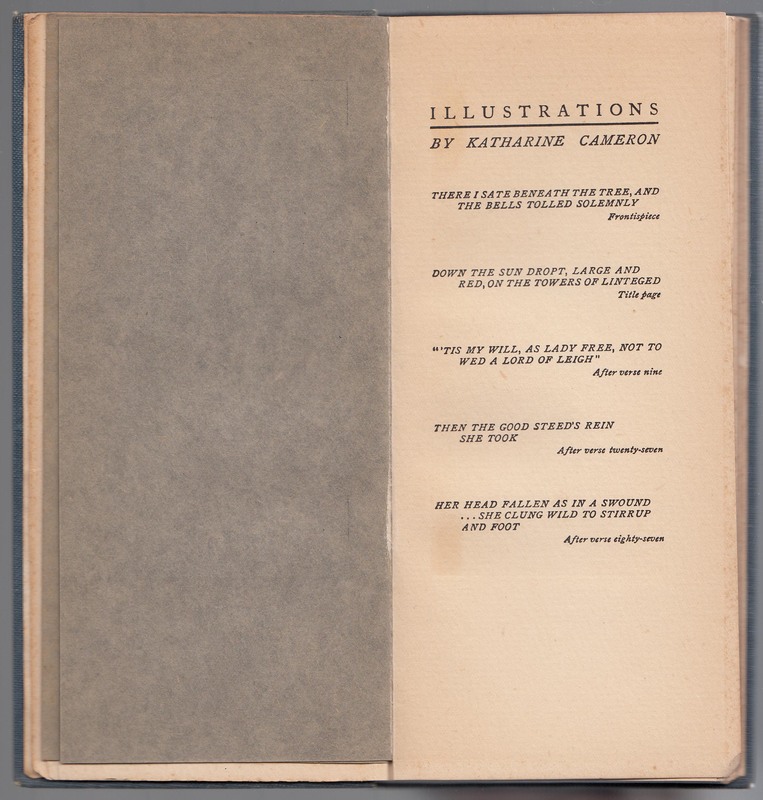 With Five Illustrations in Colour, By Katharine Cameron, R.S.W. 3. Isabella, Or The Pot of Basil. By John Keats, With Five Illustrations in Colour, By Jessie M. King. 4. The Old Christmas. By Washington Irving. Illustrated By H.M. Brock. 5. Aucassin And Nicolette. Illustrated By Katharine Cameron, R.S.W. 6. The Last Ride Together, Etc. By Robert Browning, Illustrated By Lewis Baumer And Others. 7, The Old Christmas Dinner. By Washington Irving, Illustrated By H.M. Brock. 8. The Old Christmas Eve, By Washington Irving, Illustrated By H.M. Brock. 9. The Lady of Shalott, Etc. By Lord Tennyson. Illustrated By K. Cameron, R.S.W. 10. The Old Christmas Day, By Washington Irving, Illustrated By H.M. Brock. 11. Longfellow’s Poems, Illustrated By Robert Hope, R.S.W. 12. Dr. Marigold’s Prescription. By Charles Dickens. Illustrated By Charles E. Brock. 13. Rab And His Friends. By Dr. John Brown. Illustrated By H.C. Preston Macgoun, R.S.W.